Reviews speak for themselves! We strive to keep our customers satisfied throughout the duration of the project. Check us out on Angie’s List. We have been verified by Angie’s List as “A” rated. Once again America’s Advantage Remodeling has been recognized by the Better Business Bureau. The Better Business Bureau has rated us as a A+ business! America’s Advantage Remodeling is also a proud holder of a 5-star rating in Customer Lobby. We have been recognized for our service and professionalism. Google has rated us as a 5-star business as well! We believe our customers deserve expert-design, financial flexibility, uncompromising craftsmanship to deliver a memorable home improvement experience. We are a member of Guild Quality and hold a 5-star rating. Here at America’s Advantage we aim for customer satisfaction and the reviews speak for themselves. AAR has been screened and approved as a top rated business. We hold a 4.75-star rating and have been awarded winner of the year as the best Home Advisor member for the past 5 years. We hold a 5-star rating with Houzz and are a recommended professional by the Houzz community. We have received client satisfaction awards from Houzz as well. Feel free to see our reviews and photos of projects we completed on there website. 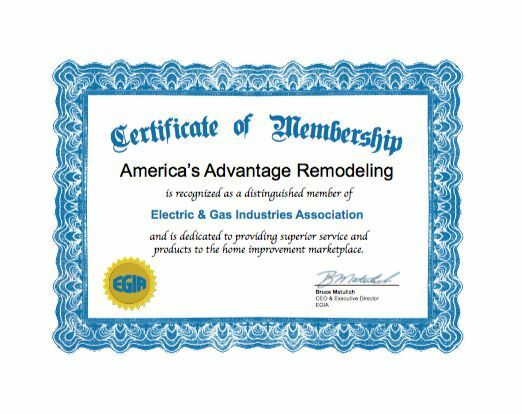 America’s Advantage Remodeling holds a 4.5-star rating with Yelp. We rely on yelp to help us monitor the quality of service we provide. We rely on customer feedback to help monitor our customer satisfaction.